I'm so excited to begin our second week of space exploration! Last week, I posted four space themed activities including our Paper Plate Sun Craft as well as a complete list of all of the books that we have been reading to learn more about the universe in which we live. 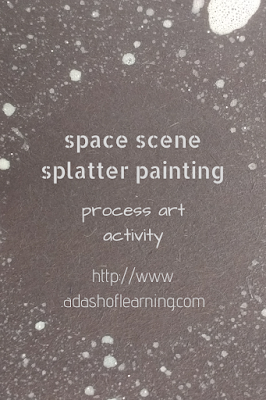 This splatter painting activity is a fun easy process art project that is very engaging (and totally messy, so you might want to consider taking it outside). It follows a very similar procedure to the rain splatter painting project that I posted last spring. We read the book Stars! Stars! Stars! Before this project. If you are interested in information about that book (or 14 other children's books about space) be sure to check out our Roundup of Children's Books About Space. Before the activity, you will need to make the planets by tracing various sized circles onto the oak tag. If you are feeling fancy, draw some rings around one or two of your planets. Finally cut out all of the planets (or let your preschooler cut them out if their scissor skills are up to it). Set the planets and the construction paper in the child's workspace. Ask them if they would like to use the cardboard planets to create a space scene. 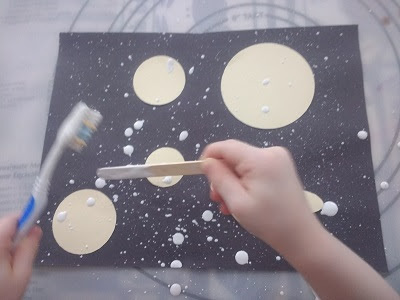 When they are finished arranging the planets, you can give them the other materials (the thinned paint in a cup, toothbrush, and Popsicle stick). 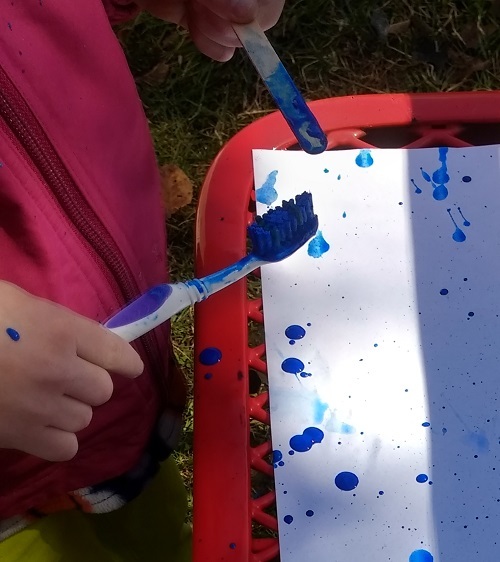 Demonstrate for them how to do the “splattering” by dipping the toothbrush in the paint (let the big drips fall off for a couple seconds) and then scraping the Popsicle stick from the front of the toothbrush to the back. It sends droplets of paint (or stars) flying onto the paper. After that allow them to experiment with the process. It's a lot of fun! 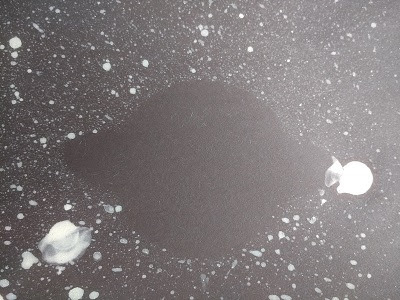 At one point, Little M. decided that a big blob of white paint was an asteroid flying through space. Pretty cool! If desired, you could even do multiple rounds of paint with various colors (yellow, red, orange, and blue are great choices). 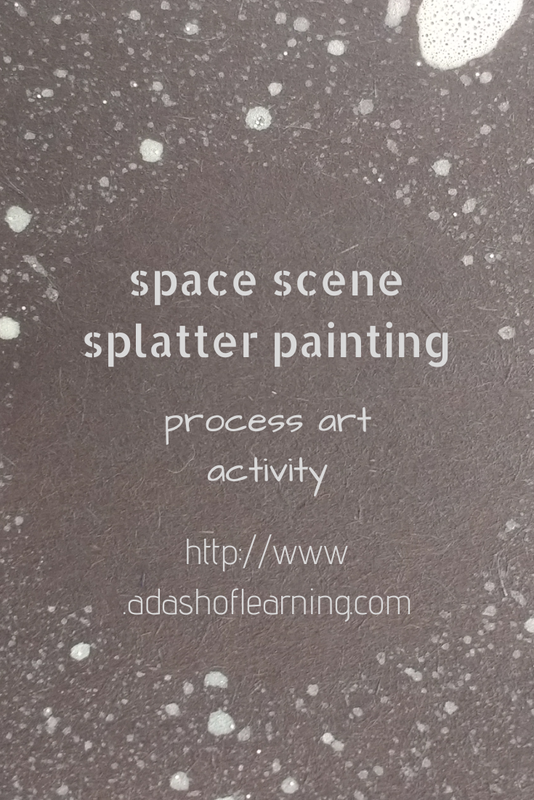 When they decide that they are done splatter painting, help them lift the planets off of the paper. There will be black starless spaces where you had the planets. Little M. thought this was so cool that she wanted to do another! If you like this painting activity check out our Pine Needle Painting Activity. Thank you so much for taking the time to stop by and read our Star Splatter Painting Activity. If you enjoyed it, please consider sharing it on social media or leave a comment below. We'd love to hear from you!